A true American vintage, Muriel cigars have been a USA favorite since the 1950’s. Made in the US, these affordable cigars feature a smooth, tasty blend of homogenized tobacco leaves that won’t disappoint. Each Muriel cigar has a delightfully mellow, smooth smoke full of velvety rich flavors in each draw. 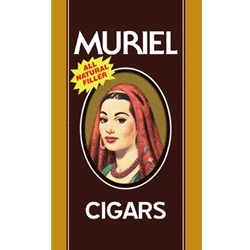 Try a Muriel cigar today here at Smokers Discounts!